I don't know why I drew this. I must have been in a demented mood or something. Why is Gir in the picture? I have no idea. Freaky, ne? I kinda like the drawing though. I experimented a little bit. Hope you like. This place made me make it all small and stuff which ticked me off, but oh well. I love you!!!!! 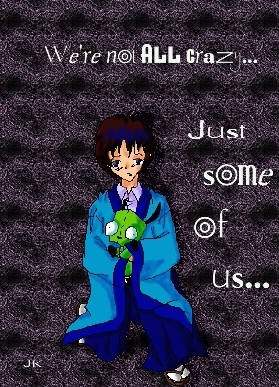 *Stuffs Sojiro and gir into his backpack* This looks awesome! SOU IS MINE BUAHHAHHAH........ ................ okay I'm bored, anyway, YOU R FUNNY nice piccy!